European vacations will go much more smoothly when you have all of your itineraries, contacts, packing details and expenses organized onto a single document. The European travel checklist helps you sort out the logistics of travel so you can complete your journey with fewer missteps and hassles. 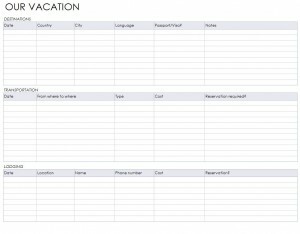 This customizable template can be filled out with details on your business or leisure travel to Europe. Travelers can easily fill in the tables with the places they are going to visit, names and numbers of hotels or contacts in each country, and a list of what they need to pack. This way, people can plan ahead and have a better idea of what they are going to do, then have a quick reference guide after the trip if they need those details later on. The free European travel checklist can be downloaded off this webpage, and packed along for easy reference on the journey. Download the template so you can fill it out with details on your travel plans. Start at the top box for your destinations: which countries, cities, and the purpose of the travel there. The second box is all about transportation: you can mention public or private transportation arrangements and costs for each destination you are going to. The third box details your lodging plans: dates, where you plan to stay, how long, and other information about the hotel or residence. In the fourth box you can put down details about your finances and currency. For example, you may want to record when you exchanged money and at what rate or how much each souvenir and destination cost. The fifth box contains all the ideas for what you need to pack; you can use this as a checklist when traveling from place to place so nothing is forgotten. The sixth box gives you a space to list the most important contacts for your trip: hotels, family, business contacts, embassies, etc. Once you return home, the European travel checklist will be a memento of the places you went to, the hotels you stayed at, and other treasured memories from your European vacation. Then, if you or a person you know wants to take another trip through Europe, you will have a private reference guide for hotels, landmarks, and transportation.